Tony Smith had just arrived at work. He took off his suit coat and hung it carefully in a closet at the back of his spacious office on the third floor of the Oakland Unified School District building in downtown Oakland. Light streamed through the arched windows. Besides the light and the space, nothing about the superintendent’s office suggested special privilege. Smith’s large desk was cluttered, and the meeting table strewn with data sheets. There are many people still waiting to see how this year turns out for Superintendent Smith, the first Oakland superintendent to be appointed by a local, independent school board since the state takeover. Smith, a Cal graduate (he played football for the Bears) and most recently the San Francisco school district’s deputy superintendent for instruction, innovation, and social justice programs, faces a stark achievement gap in Oakland, where African American and Latino children perform on average well below their white peers. The district is also losing $25 million in funding next year, after just having trimmed $69 million out over the past few years. Smith will be participating in an open town hall this Wed, Sept. 30, at 7:00 PM at Oakland’s International High School, 4521 Webster St. He spent an hour last week with Oakland North’s Lillian R. Mongeau. Q: You were never a teacher, right? Has anybody ever made noise about that? You know, I understand that people think you need to walk in their shoes to be able to represent them. I just think, through a whole series of events in my life, that I’ve put myself in a position to take responsibility for things I really care about. And creating the conditions for all of the kids, in particular those who have been less well-served to be better served–that’s what I feel really committed to. I will support teachers, and paraprofessionals, and anybody in the system, to be good at that. Q: You seem to enjoy a surprising level of support right now across the political spectrum in Oakland education, even among different groups of teachers–union teachers, “reform” teachers, and so on–who don’t often agree with each other. What have you done from the beginning to make sure you’re working with everybody? A. I’ve communicated pretty clearly that I trust teachers. The people who are in classrooms working with kids every day know the most about the conditions they’re working in. Regardless of your political leanings, or where you’re at on that continuum you described, every one of those folks should be around the table and we should be thinking together about the best way to improve the conditions for teaching so that every one of our kids gets what they need. I pretty much say that wherever I am. GO Public Schools presentation last week, Timothy Daly, of The New Teacher Project, described a study concluding that in most districts, teachers are evaluated poorly and rarely. The study calls for more rigorous evaluation to recognize excellence and encourage professional development, and says consistently low-performing teachers need to be removed from the classroom. But it also suggests alternatives to firing in most cases. What is Oakland doing, if anything, to improve teacher evaluations? A. (Smith nods; he’s familiar with the study.) That’s something we need to work on, for sure. The measure, “What does it mean to be a good teacher?” is a mercurial pursuit. It’s slippery. People haven’t clearly defined it. We have a metric right now, the California Standards Test, that’s a reductive, narrow, and very fixed multiple choice test. I don’t think it’s a great measure. We need some images of what “high quality” teaching looks like. That’s going to be a big push for me, in talking about high quality instruction, so that every young person is engaged, connected, and supported to pursue their own, unique gifts and talents, and they get to learn the core content. That’s the ultimate. Now, how do we get there? How do you develop the staff you have, to become better every day? Because we haven’t had that, there are a lot of folks who have been teachers for a long time, who are just “good teachers.” For some of those folks, parsing that apart once we have some sort of definition, might be a bit of a shock. Our understanding of good teaching is actually going to help us differentiate our support for teachers. The evaluations are to support the improvement of the profession. I am not a person who thinks we need to persistently find better, younger, different teachers. I also don’t think we need to spend our time just trying to fire those that are not adequate. Most of the work we need to do is to develop and support the talent we have, and that takes the right kind of pressure and the right kind of support. Getting that ratio right is the future of our work. Q. Is this something you think you’ll start by the end of this year? A. Absolutely. It’s already in motion, but to really codify and clarify what the plan is, that’s a big deal. Q. Many people throw around the term “achievement gap” without really understanding it. Could you define the concept, as you understand it in Oakland? A. Sure. If we just take the California Standards Test and the performance measured by the Academic Performance Index (API), the performance levels of our white students is in the neighborhood of 900. Our African American students are at 630. That’s an unconscionable gap that’s just predicted by race. This isn’t causal. Having worked with many African American children who are completely gifted, wonderful, and high-performing, I know the gap is not racially predicted–and yet performance in the aggregate is. For me, that says that we have significant structural issues. This is not a kid issue. It’s a pattern that plays out city by city, district by district, state by state, across the country. The system is producing the specific and exact outcomes that it is designed to produce if it’s this consistent across all districts. You could say, “All kids have the opportunity here.” But do they really? If you go into some schools and there are no or very few black and brown students in the Advanced Placement classes, do they have access to high quality instruction? Are there gatekeepers? Are there things that prevent them from getting in there? We have to be really aggressive about looking at what we’re saying kids need to know and be able to do. Have we created a set of hurdles and hoops that advantage or privilege some and oppress or limit others? If so, how are those things built into the system? It’s a tremendous waste of human potential to keep sorting and selecting the way we do, and to have this kind of predictable gap over and over and over again. We’ve pushed out so many kids from the system, [and because of] that we’ve lost so much hope and so much potential. We’re not set up, we’re not funded, all the ways we’re not, not, not: true. But I think this is the future of democracy. If we can’t figure this out, then you’re talking about murder rates like we have in Oakland, talking about a fractured city, talking about places where adults won’t go in the city. All of Oakland isn’t available to all of its citizens because we have not cared for and nurtured all of our children and families. That is again, not a kid issue to me. That’s a system issue. Q. You said, “We need to think differently about how we need to set up our schools to change the achievement gap. ” What is some of that different thinking? A. Well, first of all, we have to really talk about the issues that we’re dealing with. Pretty consistently people say, “The system is fine, it’s the kids that are deficient.” I’d like to talk about what that “kids being deficient” means. If we’re going to continue to blame kids and families for not being “ready to learn,” what are we gaining from that? Are we seeking justification, and for whom? Is it for a particular class and race identity, a dominant culture identity, that says, “This is what you should know and be able to do, and if you can’t or don’t want to do these things, you’re deficient and less than”? At what cost is that justification? We need to be a system that is always about putting the needs of children and families first, and then designing backwards from the needs that they have. The Japanese term is, kaizen, we have to “become what’s necessary.” That means a rethinking of structures, systems, contracts, always in service of the desired outcome. If you become rigid or unwilling to change, then it’s unlikely that you are going to continue to meet the new challenge. I mean, if you look at education, it’s not that different in the last 150 years. It’s just not. I’m incredibly committed to thinking about new kinds of relationships with local communities. We have to become beacons, and be able to infuse into those neighborhoods expectations and ways of being. That takes partnership, and leadership, and expectations, and being honest about how hard it is. We have teachers who are suffering from post-traumatic stress. They are absorbing, every day, the effects and the pain of our community violence and what’s happening to kids. I really do think that in order to get to this next place, community members have to not blame kids, and they also have to develop a deeper understanding of what it means to be a teacher in these places. This is not somebody else’s problem. This is Oakland’s issue. If we’re going to be a healthy, connected, safe, awesome city, we had all better take responsibility for the well-being of our children. That’s what I think will interrupt that pattern. Q. You said there should be as many high quality options as possible. There are a lot of charter schools here in Oakland, and the small schools movement started here almost ten years ago. Do you think having those options, and letting parents direct their kids to the place they want, is enough? Or should there be some investment at the elementary levels by teachers who are sort of shepherding kids to the option that is best for them? This is part of the story I need to help tell. This district has done extraordinary work to both create new options and to improve in the context of those new options. The district is one of the most improved, if not the most improved urban district over the last five years. I do think there is a lot of merit in what you say, that once you make connections with young people, shepherding them to the next best choice is something we probably don’t do well enough. We can’t simply say, can you survive the system as it is, and then make a judgment of the quality of children based on their ability to navigate the system. Figuring out how to shepherd, nurture, direct, expect, and push kids — that’s work we have to do. Equity to me is not equal. If you’re talking about the kinds of support necessary right now for white children to find successful pathways through Oakland — they have it. 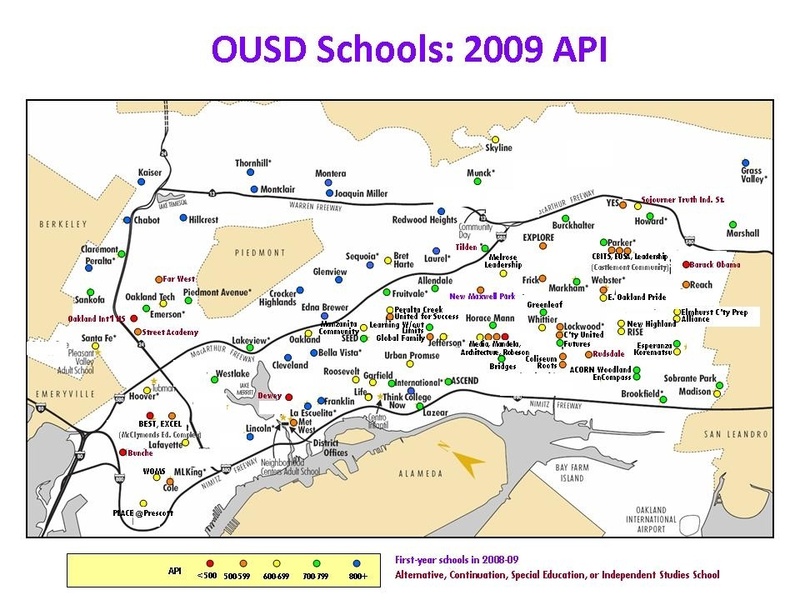 At a roughly 900 API, if you’re white in Oakland in our public schools, you are generally high-performing. There are exceptions on both ends, right? It’s not monolithic. However, when your aggregate score is approximately 900, the variance is pretty small. If you are African American, again, it’s not monolithic, but if your aggregate score for African American children in Oakland is 630, that means they’re generally performing lower than white children. So, the support necessary for African American children to find high quality options and pathways needs to be different. High quality options across the spectrum are a must. Right now we have some schools that have gotten way better, and we have some extraordinarily high- performing and good schools. But we don’t have enough. Q. Many Oakland parents choose to send their kids to parochial schools or other private schools. Do you think that that helps or hurts the public school system in any way? A. As long as the private school has a commitment to prepare young people to be civic-minded, socially-engaged, and thoughtful, then there is a public good to private school. And many of the parents of those children have chosen that because they think that’s the very best thing they can do for their kid –and I am completely in support of parents making the best choices for their kids. As a parent, where you put your kids is one of the most important things you can do. I would love nothing more than to have the Oakland public schools in every neighborhood be the first, best choice for children. And I know there are children with unique gifts, needs, attributes, and that there are other schools that will meet those needs. I want all of our schools to be in that conversation. I don’t think there will ever be a point when every child in Oakland goes to an Oakland public school. We have to get better, though. We have to be a better option for more families. Q. You have a daughter in public school right now, right? A. Yep. I have two daughters, six and four. Kaelen is at Crocker and Addison is in a Montessori pre-school. Q. You mentioned earlier that you don’t think the solution to improving teaching is just finding new young teachers. Teach For America, which has been here since 1991, along with Oakland Teaching Fellows and a number of other programs like them do recruit recent college graduates to be teachers. What do you think is the long-term effect of those programs on Oakland? So there’s a value judgment. But I think that’s also about how we value, or, I should say, how we don’t value teachers in this society. I think if we did a better job of keeping teachers once they’re in, and in supporting and helping every teacher become a high quality teacher, there would probably be a decreased need for the numbers we’re currently getting from these programs. There’s a lot that’s good about the partnerships we have, and I think there’s something about them that is not yet calibrated right. Q. With all the budget cuts, what you are doing with construction and facility improvements this year? And what about extracurricular activities? Will they be cut and how important do you think they are? A. The money for construction and facilities is different than the money for programs. Honestly, there are two very distinct, different buckets. We have money for facilities, fortunately, through bonds, and the good work of our facilities department. Tim White, the Assistant Superintendant for Facilities, is awesome. We are really fortunate in this district to have someone who is fiscally savvy, who thinks about construction and the buildings really well, and also has a really deep and strong commitment to sustainable development. Our facilities department is one of the strengths of the district. It’s pretty exciting, because the built environment is crucial to some of these other issues that we’re talking about. Tim gets that. The other bucket’s a problem. We are not funded at the rate necessary to truly meet the needs of every child. I am going to be leading the process, over the next few months, where we have to reduce next year’s expenditures by $25 million. Over the last two years, the district expenditures or budget has been cut by $69 million, so we’re about to have to cut another $25 million. We can’t just keep trying to do the same things with that much less money. When you start cutting zeros off the budget, you have to increase your creativity pretty intensely. I believe, more than ever, that partnerships are the key. Extracurricular activities, mentoring, internships — the city has to be the classroom. How do you foster that? What are the connections necessary? I don’t have a total answer. I do know that we cannot eliminate our music, extracurricular activities and sports. If we go about eliminating all of the things that animate young people in schools, we will have failed. Tony Smith at his desk. I think Smith’s approach and character are inspiring. He’s right: the kids are not deficient. I like this concept of kaizen, to “become what’s necessary.” More power to Tony Smith and his team. I heard Tony Smith plans to return 6th grade students to elementary schools: to improve child safety, child retention, and the quality of education for pre-teens. This I am told will also lighten the middle school load and let the district focus on improving education for 7th and 8th graders. Why wasn’t this proposal addressed it’s the best idea I have heard come from the OUSD in years. I hadn’t heard about that plan. It does sound interesting. I will ask around and see if that idea is for real and whether it is still on the table. Where/When did you hear about it? Excellent interview, Lillian. Thank you. I’m not sure how Dr. Smith’s ideas will work out in practice, but he has been much more open with his underlying philosophy than other superintendents have been. At least some of the improvement shown by the two maps you posted represents changes in the way the API is computed by the state, not actual improvement. In 1999 the lowest 20% of students on the SAT9 were considered Far Below Basic. As the California Standards Tests replaced the SAT9, the definition of Far Below Basic was changed to the lowest 15%. That change by itself would move most schools out of the red (lowest) category. Ann, I would be very surprised if the district moved to return 6th grades to elementary schools, if only because of the overcrowding that would create at many popular elementary sites. Most hill schools would be unable to accomodate all the neighborhood children, much less any open-enrollees. Our organization, Experience Corps, works in several of these underperforming, underserved schools, predominantly low income children of color. We are trying to “do our part” to help Oakland education by mobilizing our 55+ population and training them to be tutors and mentors for these students. It’s an untapped resource in our society but can make a huge difference once mobilized. While we’ve seen great strides in the kids we work with, we also see – in support of what Dr. Smith discussed – a systemic problem of unequal access to “options for success” and support Dr. Smith in his mission to change the way OUSD serves its children. We are also always in welcome of more Experience Corps members, who can give as little as 2 hrs/week to serve kids. For more information about our program, to see what schools we serve, and/or if you know of another program we can/should partner with, please get in touch with us. (510) 495-4966, dmoren@aspiranet.org, or http://www.experiencecorps.org. Great interview! !